When Should I Call the Doctor about Hearing Loss? What Are the Exams and Tests to Diagnose Hearing Loss? Are There Home Remedies for Hearing Loss? What Is the Medical Treatment for Hearing Loss? What Is the Follow-up for Hearing Loss? What Is the Prognosis for Hearing Loss? In air conduction, sound waves move through the air in the external auditory canal (the "ear canal" between the outside air and your eardrum). 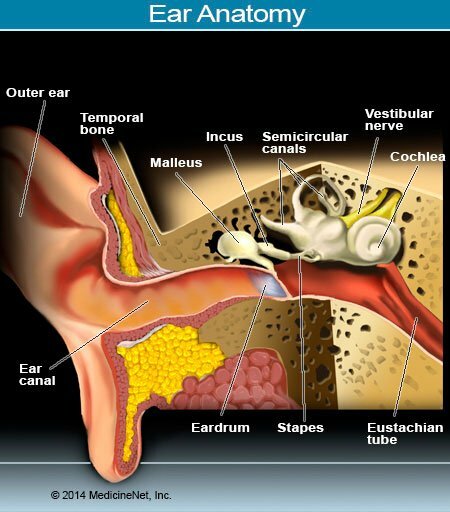 The sound waves hit the tympanic membrane (eardrum) and cause the tympanic membrane to move. There are 2 basic types of hearing loss, which is called conductive and sensorineural. Conductive causes: Conductive hearing losses result from physical problems with the movement of the sound wave through the ear. A simple example is blockage of the ear canal. Obstructed external ear canal - Cerumen (wax) build-up, hematoma (blood collection), or foreign body in the ear canal. This is one of the most common causes of hearing loss and the easiest to fix. Sensorineural causes: Sensorineural causes are from damage to the hair cells or nerves that sense sound waves. Acoustic trauma - Prolonged exposure to loud noises causes the hair cells on the cochlea to become less sensitive. Ototoxic drugs - Certain drugs can affect hearing by damaging the nerves involved in hearing. Usually, this occurs when large or toxic doses are used but may also occur with lower doses. Vascular diseases (problems with blood vessels) include sickle cell disease, diabetes, leukemia, polycythemia, and diseases in which excessive blood clotting occurs. Children and adults with kidney problems are more susceptible to sensorineural hearing loss. Ménière disease - A disease that affects hearing and balance. It is usually associated with tinnitus (ringing in the ears). It has a gradual onset and may progress to deafness and severe vertigo. The cause is unknown but thought to be associated with fluid shifts in the inner ear. Acoustic neuroma - A tumor in the auditory nerve. Usually associated with ringing in the ears. Infections, include some occurring during pregnancy and soon after birth in neonates. Hearing loss may be unilateral (only 1 ear) or bilateral (both ears). The unilateral hearing loss is most often associated with conductive causes, trauma, and acoustic neuromas. Your hearing loss is sudden and prolonged. This is considered a hearing emergency and better outcomes are typically associated with rapid evaluation and treatment. Sudden sensorineural hearing loss persists throughout the day and should be evaluated as an emergency. You have associated symptoms such as ringing in the ears or vertigo. You have a fever or pain. You are taking any medications that affect hearing. Each ear will be tested separately to see if you can hear the sound coming from a tuning fork. The tuning fork will also be placed on top of or in the front of your head to assess on which side the sound may be louder. The ear canal and tympanic membrane will be inspected with an otoscope (a special instrument with a light and a tip to look into the ear canal). The nose, nasopharynx (the part of your throat that your ears drain into, located just above your soft palate), and upper respiratory tract usually will be carefully examined. A general neurologic exam, which includes tests of the nerves that control movement, sensation, and reflexes, will be done. If a process inside the brain (such as an acoustic neuroma) is suspected, a CT scan or MRI of the brain may be performed. If an infection, vascular problem, or drug interaction is suspected, blood tests may be performed. Tympanometry may be indicated if a problem with the tympanic membrane (eardrum) is suspected. This test evaluates the ability of the tympanic membrane to move and the middle ear’s ability to receive sound waves. When the cause of the hearing loss is unknown, it is best to seek medical attention. If you know that earwax has built up in the ear, over-the-counter preparations can be used to soften the wax so that it can come out of the ear on its own. Never use cotton swabs to probe into or clean the ear canal. Do not place cotton balls and liquids into the ear canal. Use acetaminophen (Tylenol) to lower fever or pain until you can see a doctor. If you have hearing loss that cannot be cured, hearing aids can be of great benefit. If a foreign body is found in the ear canal, the doctor will try to take it out. It can be removed by flushing the canal with water, using suction, or using forceps. Cerumen (earwax) in the canal is removed by flushing the canal or scooping out the wax with special instruments. If the wax is too hard to remove, the doctor may prescribe softening drops (also available over-the-counter) and have you return in a week to try to remove it again. If the infection is found, antibiotics will most likely be prescribed. Middle ear infections usually require pills, while infections of the ear canal can usually be treated with eardrops. If the eardrum is perforated from an injury, no medicines will usually be prescribed. A follow-up visit with the same doctor or an ear, nose, and throat specialist (otolaryngologist or ENT) will be suggested. Eardrum perforation from an infection is usually treated with antibiotics. If a problem is suspected with the bones of the middle ear or nerves, a referral will likely be made to a specialist such as an ear, nose, and throat specialist. If the cause of the hearing loss is due to medications, the medication will be stopped or changed. If there is a tumor, such as an acoustic neuroma, a referral to a neurotologist (an ear, nose, and throat surgeon specializing in and ear surgery) or a neurosurgeon (a surgeon specializing in brain, spinal cord, or nerve surgery) will be made. If associated symptoms are troublesome (tinnitus, vertigo), anti-anxiety or motion sickness medication may be prescribed. If Ménière disease is the suspected cause, certain diuretics, antihistamines or nicotinic acid can sometimes be helpful. A low-salt diet may also be suggested. If the hearing loss is a sudden sensorineural loss, oral steroids may be started by the physician and an otolaryngologist may inject steroids directly into the middle ear. Most causes of hearing loss do not require admission to the hospital. Many treatments are available for permanent hearing loss. People with conductive hearing loss can have the middle ear reconstructed by an ear, nose, and throat specialist. Hearing aids are effective and well tolerated for people with conductive hearing loss. People who are profoundly deaf may benefit from a cochlear implant. Noise-induced hearing loss is usually permanent and progresses with each exposure. Use proper ear protection when working around loud noises. Never put foreign objects in the ear. Do not use cotton swabs to probe or clean the ear canals. Do not put cotton balls or liquids into the ear unless prescribed by a doctor. Treat middle ear infections as soon as possible. Hearing loss may be prevented by prompt treatment. Most doctors believe that fluid in the middle ear (called an effusion) lasting longer than 6-12 weeks should be drained and tympanostomy tubes (ear tubes) placed in the middle ear. If you are taking medications that can cause hearing loss, your doctor should carefully monitor their levels with blood tests. The likelihood that hearing will return depends on the cause of the hearing loss. 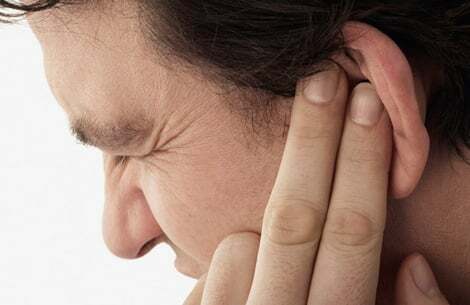 Hearing will usually return to normal with the removal of foreign bodies in the canal, removal of wax in the canal, and treatment of ear canal infections (otitis externa). Hearing will usually return to normal after treatment of middle ear infection (otitis media). Antibiotics are usually given for 7-14 days. Rarely, a second course of different antibiotics may be necessary if the infection does not respond to the first type of antibiotic. It may, however, take a longer period of time (even as long as three months or more) for the fluid in the middle ear to resolve completely and the hearing to return to normal. Injuries to the tympanic membrane will usually heal on their own. Once healed, hearing usually returns to normal. If the perforation is large (bigger than 50% of the membrane), surgery may be required to fix the eardrum. A skin graft is sometimes used to replace or fix the tympanic membrane. Hearing loss due to drugs may or may not return with the withdrawal of the drug. No proven treatment restores the hearing other than removal of the drug. Some doctors may try giving drugs known as steroids to restore hearing. Hearing loss due to infections such as meningitis may not return. The doctor may try using steroids during the illness to decrease the amount of hearing loss. Hearing loss due to Ménière disease, acoustic neuroma, and age is usually permanent. "Evaluation of hearing loss in adults"
What was the cause of your hearing loss?